Englewood Hospital and Medical Center is dedicated to the promotion of wellness in our community through nutrition education. We offer two programs to optimize health and well-being. Medical nutrition therapy is available for people who have been diagnosed by a prescribing practitioner with a health condition requiring dietary changes. 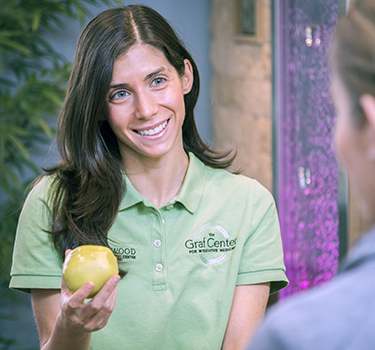 Our holistic nutrition program, offered at our Graf Center for Integrative Medicine, is for anyone interested in improving their health and well-being. 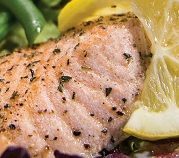 Englewood Hospital and Medical Center’s outpatient nutrition counseling service provides comprehensive, individualized nutrition guidance through the use of medical nutrition therapy (MNT). This therapy includes assessment, nutrition diagnosis, and recommendations about dietary changes to prevent diseases and improve health. Who can receive medical nutrition therapy? Who provides medical nutrition therapy? Registered dietitians (RDs) work with patients to tailor a diet based on their diagnosis, dietary history, other health needs, and nutritional and lifestyle goals. Under the guidance of a dietitian, MNT sessions include strategies to promote wellness and treat specific pre-existing conditions. Is medical nutrition therapy covered by insurance? Insurance is accepted, but coverage varies among insurance providers and plans. Patients should contact their insurance provider to verify coverage and allowed number of sessions per year. What should patients bring to their nutrition counseling session? Patients should bring a list of any prescription drugs, over-the-counter medications, vitamins, minerals, and dietary supplements with them to their nutrition counseling session. Patients may also be asked to bring a food diary. To make an appointment, call 201-894-3097 between 7 a.m. and 7 p.m. The Graf Center for Integrative Medicine at Englewood Hospital and Medical Center offers a holistic approach to health and wellness, focusing on the mind and body as one. 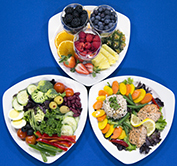 The Graf Center offers a range of evidence-based services, including nutritional counseling. Who can receive holistic nutritional counseling? Anyone can receive nutritional counseling at the Graf Center. A prescription or referral from a physician is not required, but an appointment is needed. Anyone can benefit from holistic nutritional counseling. A holistic approach to health is about considering the person as a whole, taking into account a person’s physical, emotional, mental, and spiritual wellness needs. Holistic treatment identifies a person’s lifestyle preferences, eating/food habits, and activity and stress levels while developing a strategic plan focused on making choices that fit health goals. Are holistic services at the Graf Center covered by insurance? Patients will be provided with treatment information that can be submitted to their insurance company for consideration. Though not required, a prescription from a physician indicating the reason for the holistic service may help with reimbursement opportunities. To make an appointment, please call 201-608-2377 or email grafcenter@ehmchealth.org.